On Christmas Eve, after Santa put out the presents, I decided to take some pictures of our Christmas decor. The house was so peaceful with Jillian sound asleep in bed and Jeff passed out on the couch. 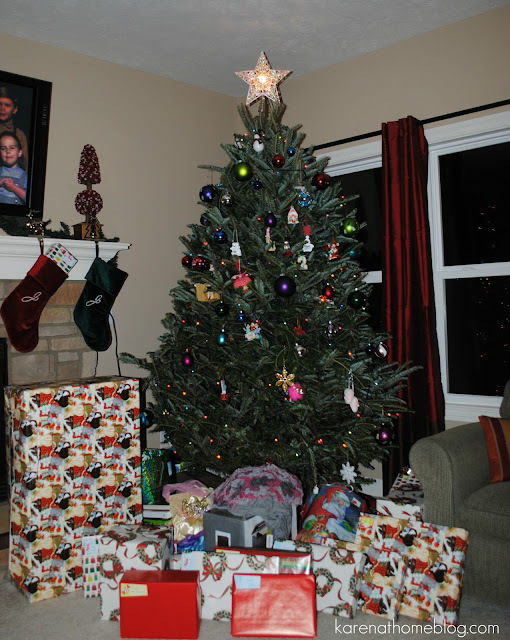 Although I would have liked to have done more with our Christmas decor this year, I am pleased with how it turned out. My goal next year is to switch the colored lights for white lights and add some tulling as garland and as a tree topper. I bought the light up Christmas presents last year at Marshall's and was so excited to break them out for this year. I think out of all my Christmas decor, these are my favorite!!! 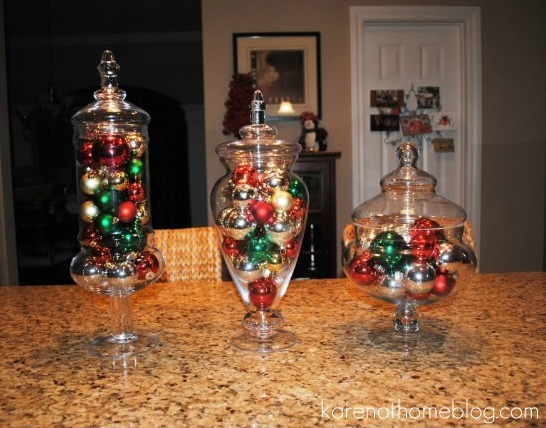 Last year, I found a fun way to use Christmas ornaments in my Apothecary jars. 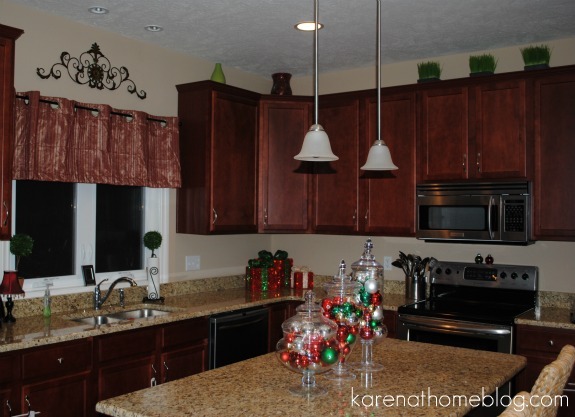 They add so much Christmas color to our kitchen! 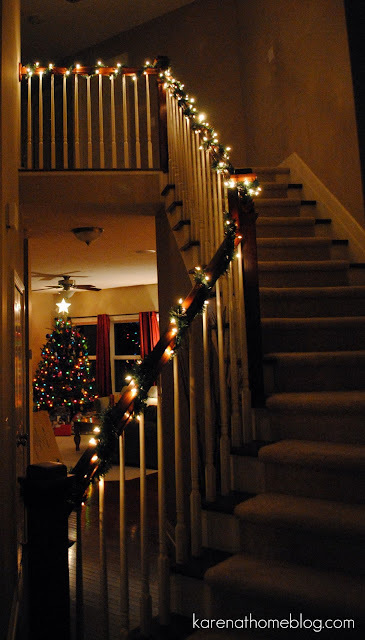 I have decorated our staircase the same way for the past three years and I like the simplicity of the garland and the lights. I am thinking of possible adding a little more pizazz to it next year but for now, it's perfect! I hope you enjoyed the tour of our home during Christmas!!! 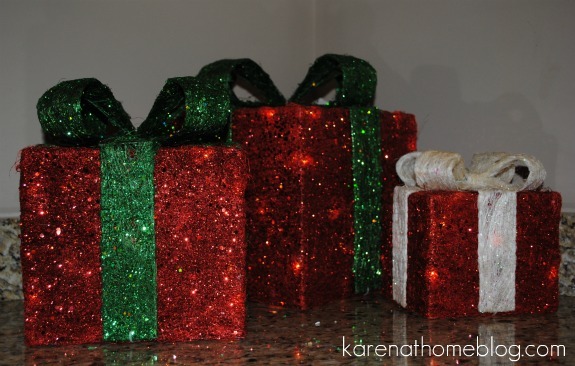 I am linking up today to Kelly's Korner Blog, The Nester﻿, Blue-Eyed Bride, Thirty Decor Chic, and Christmas Cheer Link Party. Very pretty and festive. I love seeing the way everyone decorates their homes. Gives me ideas. Love the decorations Karen! Beautiful! I hope that things have been well for you. Gosh, I feel so outta the loop these days! It's taking all I have to get a post up here and there. I hope you're feeling well & that 2012 brings you MANY BLESSINGS! So pretty! I still don't have apothocary jars. One day!! I love the light up presents. I love your decor ... and especially your kitchen. Currently trying to accesorize mine and struggling with what to put above the cabinets. Thanks for the inspiration! It looks great! I love those presents...perfect in the kitchen.